Oil on canvas with Asian motif, brush stroke and Western color. This is numbered and limited print of original Sumi painting "Whoe Doesn't have the First Time by Yuming Zhu. Painting Paper Size: 17" x 11" ; Shipping: rolled in tube. Yuming Zhu is a very passionate and well-known artist in the Great Seattle area. 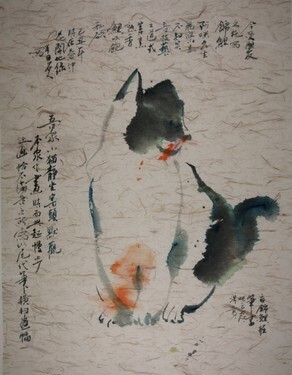 Sumi/Chinese Watercolor, Oil and Pastel are the mediums Yuming loves to express himself with. He participated in the “Five Thoughts of Asian Art” program that was offered through the Seattle Art Museum and KCTS Channel 9. He continues teaching sumi painting and calligraphy at community colleges, art centers at the Greater Seattle area and nation-wide. Also he shows his artworks at galleries. Please see the links to the galleries.